Hi everyone! 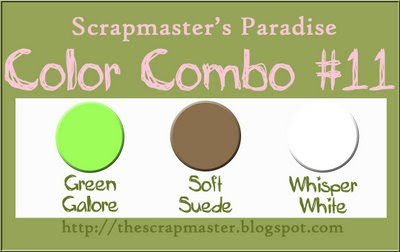 I missed two color combos at Scrapmaster's Paradise because of vacations...but i'm back!! This was a fun color combo, too!! Papers are Bo Bunny and Papertrey Ink (brown polka dots) and the stamp is a 'new' stamp set to me by Close To My Heart. I had fun inking that one up for the first time! I love the fringed ribbon (I think by Maya Road?? ), adds some fun texture!! You should definitely go check out the color combo this week and all the DT examples. It's a fun one!! Thanks for stopping by!! This is gorgeous! Love how rich that brown is. Fabulous! I love the card, and especially the ribbon! Thanks for joining us at SPCC. Absolutely amazing. I love the brown ribbon, it adds some great texture. Thanks for playing this week at SPCC! Glad you could join us at SPCC!! Gorgeous! I love that Websters Pages ribbon!! This is really fantastic! Glad to see that you are BACK! Hope vaca was fun! LOVE your card! & that chocolate ribbon is gorgeous! so wonderful!! love the green and brown together - and that ruffled ribbon is awesome!! thanks for stopping by my blog and leaving such sweet words too! Fantastic - love how you have used that gorgeous brown ribbon. This is the perfect card for the color combo! Great job, Mara! Very pretty card and that ribbon is amazing! I've been seeing lots of people do this color challenge, I think I'll try it out too, definitely not my normal colors! Have a great day! Love your card and the two ribbons.... Very nice!!! This is adorable! I love the tree and your ribbon is just too cute! Congrats on Finally Friday too! Hi, Mara! This card is fun, fun, fun! It's just one of those magical hunks of paper crafting that wants to be held! I just love it! You do lovely work! Thanks so much for your kind words on my blog! Have a great weekend! Great job! Love the ribbon! So wonderful! Love the tree and the ribbon! The sentiment is so great too! Cute, cute card. I love the brown and green together. PTI Blog Hop is TONIGHT!! By the way...check this out! Happy Birthday Color Me Daisy!! !